The Secret Spiritual World of Children by Tobin Hart, Ph.D. Thank You, Angels! by Doreen Virtue, Ph.D. REACHING the creative mind that lies naturally in all children is so important! In our teaching experiences we have found young children to be very wide open about their feelings, their thoughts and their stories. They need to feel safe, however. They need to be nurtured in the concept that ALL of their ideas are worthwhile and valued. This is an important educational insight we will talk about. Be sure to check out our Educational Insights Blog! 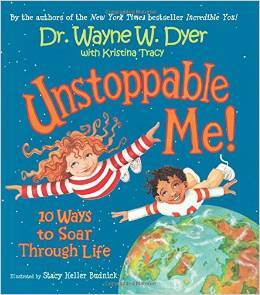 We have found Dr. Wayne Dyer’s books for children to be very uplifting and thought provoking for both the child and a parent/grandparent/guardian reading the book to a child. These are some of our favorite ones. We have many author’s of children’s books to share, so keep watching as we share more of them! We will put a guideline for ages, but it is really good to remember that they can be used very effectively with children in many different age level brackets. Here is one of our ALL TIME FAVORITES! The two words I AM, are indeed very important to all of us! We’ve heard them in scriptures and we use them in our daily lives VERY OFTEN. As adults we have been conditioned to use them in both positive and negative ways. Children need to hear the positive side of the words I AM. 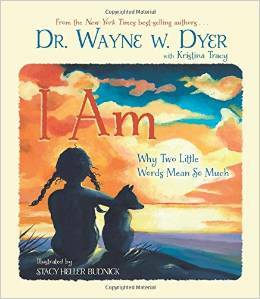 Dr. Wayne Dyer is helping little minds to realize that God is right inside of them. As adults it took us awhile to realize how powerful this gift is. God right with us every moment of the day. This story is delightfully written in a playful way for their young minds. The message inside this book is equally powerful for adults!! And, in fact there is an adult version written by Dr. Wayne Dyer called, Wishes Fulfilled. 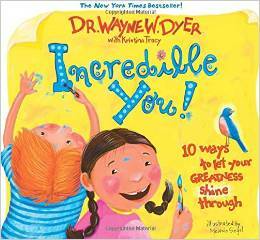 Each page of both of these books brings great ways to help the child in your life to find their OWN greatness! Childhood can be very tough. For children, understanding what is happening around them can be very confusing. As teachers we found the books very useful as story starters for writing as well as conversations that might be needed in particular situations. Starting a dialogue early in life helps bring everyday situations to the surface for many quiet children that may not discuss their feelings easily.. We find Incredible You! easier to use with young children. Unstoppable Me has a higher level of understanding if read in its entirety. The concepts can be made easier using the reader’s own voice simplifying the words. Marj spoke of how very important it is for all of us to keep our brains “imagining” as adults. In children, imaging comes pretty naturally as long as it is nurtured by caring adults! !